Through the years I’ve mastered the art of waiting, especially when my boys (I have three) go to Rocky’s for a routine haircut. So I thought what can I do? I’ve entered a no-female zone, so often I just wait on the sidelights and read the paper. But Rocky’s, Davao’s homegrown chain of barbershops, widen their reach to accommodate not only the men in our lives but we mommies as well. Did you know you can also be pampered while waiting for your boys to rise up from their comfy chairs? Yes! Services like manicure / pedicure and foot spa are being offered in all Rocky’s outlet here in the city. You don’t need to have another schedule to get your nails done. They have nail experts who can do the job alongside the boys being groomed on the high chair. Isn’t that awesome! Exactly the reason why #iLoveRockys. Besides these awesome services, Rocky’s has more for their loyal patrons. Rocky's, the first barbershop in a mall, launches its September promotion entitled #iLoveRockys. 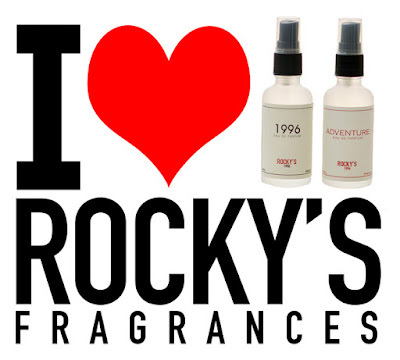 Up for grabs are Rocky’s fragrances, 1996 and Adventure. 1996, Rocky’s signature fragrance pays tribute to the year the first Rocky’s branch opened in Victoria Plaza Mall. Classic and traditional is what the 1996 perfume exudes. It is woody, aromatic and musky with lemon and lavender on the top notes, tarragon and thyme for the middle notes and patchouli and musk for the base notes. Adventure embodies the young, daring and modern “ Rocky’s Man” – fresh and full of optimism. It bears a light and fresh citrus, woody marine fragrance with lime and bergamot for top notes, cedarwood for middle notes and grey amber and musk for base notes. Here’s how would you can score a bottle of 1996 or Adventure for free. The promotion is open to all Davaoeños with a personal Facebook and/or Instagram accounts (with their face photos on the accounts) in Davao City only. Women can join too, because Rocky’s barbershops offer services women can enjoy. Repost the iLoveRockys photo from the Rocky’s Barbershop Facebook page (Rocky’s Barbershop) or Instagram account (rockys_barbeshop) on your personal account with a comment why you love Rocky’s, and add the hashtag: #iLoveRockys. Ten (10) winners will be chosen and will receive a bottle of Adventure or 1996 perfume each. Names of the winners will be posted in Rocky’s Barbershop Facebook and Instagram accounts on the first week of October. Good luck and don’t forget to hashtag #iLoveRockys.